The summer finally arrived. The temperatures reach 35 degrees of Celsius, the sky is cloudless, and the sun burns as in hell. And sometimes after the sunset arrive wild thunderstorms. Just two days ago lightning hit the temple across the street – fortunately the clergy installed lightning rod instead of just pure belief, so only the lightning went out. In these hot days I still drink tea, lot of tea. But instead of powerful ones I choose something more delicate. Today I tried a sample of Pomelo Fragrance Phoenix Dan Cong I got from Imen last time. The sample was quite small, 3 grams only so I decided to prepare it not in yixing but in my smaller gaiwan instead. The leaves were large and uniform, very dark green with some lighter colours. This tea is different from other Dan Cong oolongs I got from Imen. It lacks the typical fruitness, the prevailing taste is spicy and fruity. Cinnamon, touch of pomelo, orchids, honey. 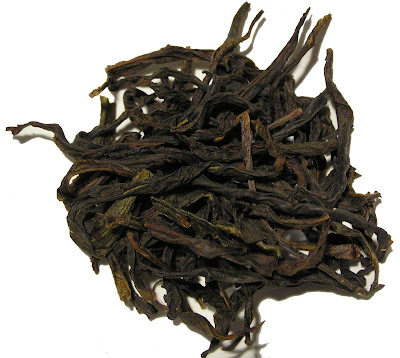 Unlike some of the oolong or Dan Cong teas, this tea performs well both in means of smell and taste. The taste is sweet, calming, and soft. It’s a nice tea ready to be enjoyed in hot evening. That's why I like Pohenix Dan Congs. Hot weather and Dan Cong. Good suggestion. Thanks! 2007 Xi-Zhi Hao "Xue Shan Chuen Lu"
2001 MengHai Special-order "Yi Wu Zheng Shan"